The Butterley Company began mining coal and ironstone in nearby Butterley Park in the early 1800s. 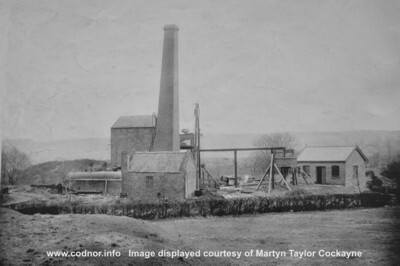 However the company soon found that underground water was a considerable problem and that steam pumping engines (Fire Engines as they were known at the time) would be required to prevent the mines from flooding. Fig.1 Map dated 1901 showing location of pumping station and abandoned Butterley Park shafts. 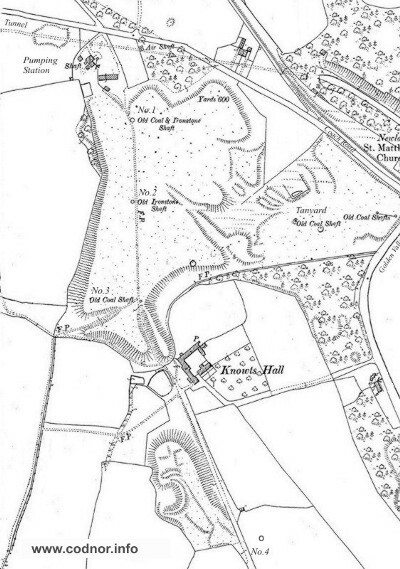 The Butterley Park Pumping Station is identified as New Close Engine House on John Wright’s map of 1828. It was located just off the Golden Valley to Ripley Coach Road close to Woollacot’s farm. A shaft was sunk in 1841-43 to the Ironstone seam at 125yds deep. The pumping station had a beam type pumping-engine that concentrated on draining the Butterley company South workings. Water was pumped from the mine workings and into a sough, which drained into the nearby Butterley Tunnel on the Cromford Canal. A survey of the Butterley Tunnel in 1907 by Henry Eustace Mitton records at 13 chains (47ft 6 inch) from the Eastern portal, the mouth of an outlet from the Butterley Park pumping Station, 2ft 6in high and 3ft wide. Fig.2 Butterley Park Pumping Station circa 1907. This is now the location of the Golden Valley caravan Park. William Langton had been attending to some repairs to the pumping engine, but when it started the beam knocked him down a ladder on which he was standing, throwing him to the ground. He died a few days later on the 30th April. The pumping station closed in 1909. All located on a parcel of land known as Brothel Meadow, now the location of the Golden Valley caravan Park. Under Manager: Mr Thomas Steeples. 153yds deep to Hard coal, air pit to Black Rake seam. I had been working in No. 2 Butterley Park mine for three and a half years, when during the Christmas holidays a serious disaster occurred. On the Sunday morning when the men responsible for the foddering of the ponies and donkeys had started down the shaft, they soon realised that something unusual had occurred. The air was foul and suffocating. On arriving at the pit bottom, they signalled to be quickly drawn up again. The cause was readily surmised. During the night there had been an immense fall of roof a short distance from the shaft, just beyond the stables, and the main gangways and all the air-ways were blocked. The news spread quickly, and groups of volunteers were soon at the pit mouth, ready and willing to do their best to save the poor animals. One set of men after another took the risk of going down and endeavoring to get to the animals, but failed; the air became more stifling. In trying to save a fine young pony, the mine gaffer, Mr. Langton, nearly lost his life. For days the men worked in shifts in the suffocating fumes, and when at last they got to the poor animals, all of them were dead. One by one they were brought out: old Tom and Merry, Taf and Charlie, and half-a-dozen more that had fallen victims of one of the worst disasters that occur in mines: air stoppage and foul poison gas. They were all buried in a field close by, and we youths who had ganged them, and knew them so well, had difficulty in hiding some sorrowful tears. The damage to the mine was so extensive that it had to be closed down; it was never fit to be worked again; and we youths and men had to seek work elsewhere. Had the disaster occurred while we were at work, we should all certainly have met the same fate as the animals, for the nearest pit shaft connecting with ours was more than a mile away, the circuitous under-ground route to it would possibly be three miles, and the airways through which we should have had to go were so small in places as to be little bigger than a man’s body. They ‘were used only on very rare occasions, and would not only have been difficult to crawl through, but in doing so, the limited amount of air would have been foul and suffocating. After this disaster, Joseph Millot severn went to work in Forty Horse coal mine. Also location of Magazine for the storage of explosive charges for the mines. 110 yds deep to Black Rake Ironstone, 150 yds deep to Hard Coal. 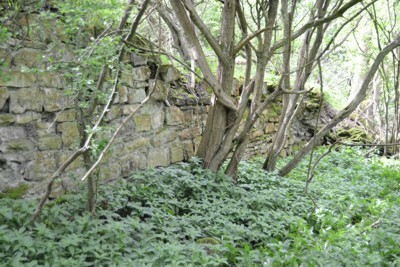 Fig.3 A stone retaining wall reaching 8ft high in places, at the side of the old tramway at the location of Butterley Park No.4 pit. 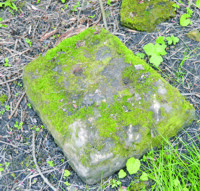 Fig.4 Rubble and remains of coal tub at the location of Butterley Park No.4 pit. 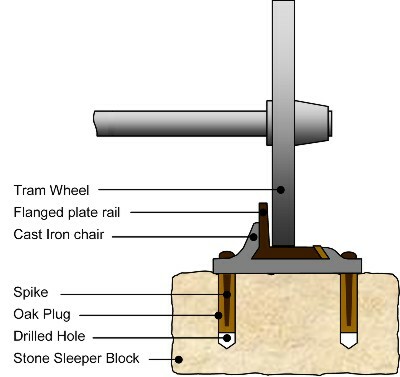 Fig.5 Stone sleeper block with two holes. 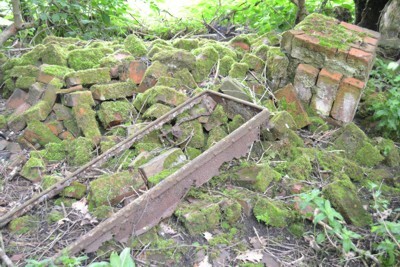 Found on the old Tramway at the location of Butterley Park No.4 pit. 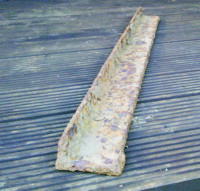 Fig.6 4ft Flanged Plate Rail found on the old Tramway at the location of Butterley Park No.4 pit.